Arrow Electronics has signed an agreement with DH electronics to supply DH’s range of embedded modular solutions and team with DH for integration. DH has been developing and manufacturing scalable and customisable embedded solutions for 25 years. Arrow will offer these throughout Europe, Middle East and Africa (EMEA). 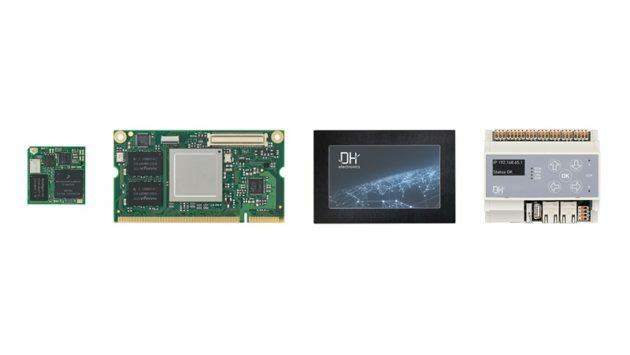 The DH electronics range comprises three main product families: DHSOM system-on-modules (SOM), which are compact embedded computers that can be plugged in or soldered to carrier boards; DHMI touch panel computers that enable human-machine interfaces to be easily added to systems; and DHCON control and connectivity products that are optimised for smart home and building applications, as well as to support IoT and Industry 4.0 use cases. Integrating essential processing and communications interfaces in a highly compact SOM provides companies with an ideal base for product development. Time-to-market, costs and risk are reduced, and developers can focus their full attention on the elements of their design that benefit most from their specific expertise. Board support packages are available for Linux, Android and Windows and other supported software includes Debian, Yocto and the Qt framework. On top of the standard product range, Arrow will offer customers access to DH’s customisation services, which help to ensure that hardware and software is optimised precisely for their requirements.